According to Biff Reading, manager of the Grand Army of the Republic Cemetery, west of Snohomish on Riverview Drive, the construction crew also had to build a grandstand for the large number of invited dignitaries. Topping the list was Governor Ernest Lister. “His sentiments expressing the hope that in the near future the disputes of nations would be settled without recourse to arms, received hearty applause,” reported the Tribune. Lister was re-elected in 1916, along with President Woodrow Wilson who declared war on Germany the following year. Morton Post #10 of the Grand Army of the Republic (GAR), established the cemetery for its members of the Union Army, veterans of the Civil War, and the first burial ceremony in the new cemetery was for Sgt. Maj. Henry Herring, who died in August 1898. As time folded into the 1920s, the few surviving members of the post passed responsibility for the cemetery to the American Legion. Day to day management, however, rests in the hands of Joseph Reading III, who goes by “Biff,” a handle his sisters gave him in childhood. Biff began on-the-job training from his father nearly 40 years ago. 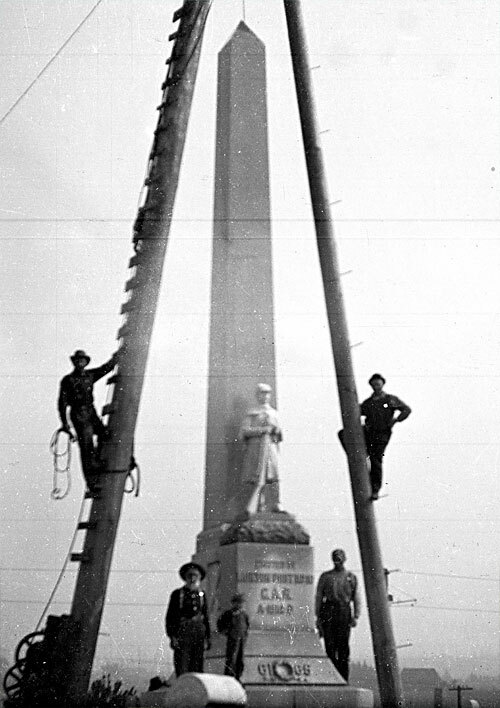 The Tribune estimated that between 4 and 5,000 people “witnessed the dedication of the G.A.R. 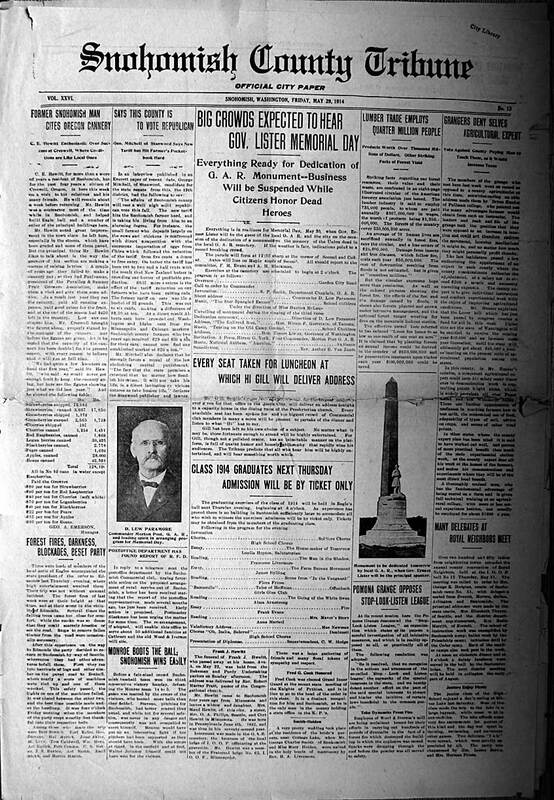 monument” on May 30, 1914, which began with a parade from town – “the biggest ever seen here” — reported the paper in bold type. O f course, you don’t have to worry about that many people witnessing my second annual tour of the cemetery on Saturday, October 23rd at 10am., to which you are invited. Follow the signs to the caretaker’s garage at the end of the drive at 8601 Riverview Road, Snohomish. Allow an hour and half, prepare to walk on uneven ground and the tour will be conducted in rain or shine (last year it was gorgeous). A suggested donation of $10 will help support this website. This intriguing image comes to us by way of Melinda Van Wingen, Northwest History Specialist with the Everett Public Library. Melinda is in the process of cataloging the extraordinary postcard and photo collection of Ernest Hederick (1894-1979), given to the library by his family. Even long time manager of the G.A.R. Cemetery, Biff Reading, has never seen a photograph of the monument’s installation. “I still don’t understand how they did it,” he said, studying the photograph closely. Photo courtesy Everett Public Library, Hederick Collection. 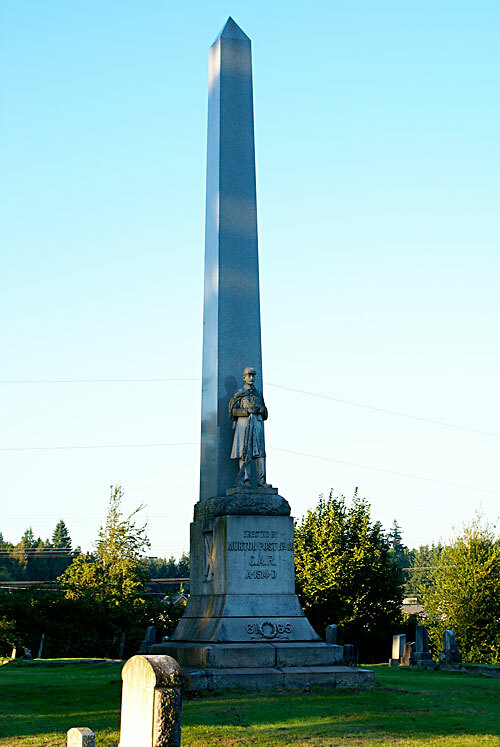 The monument, dedicated on Memorial Day, 1914, stills stands graceful guard over the cemetery plots of both veterans and non-veterans alike — many of whom were the founding settlers of Snohomish City. Repeat photograph is by the author, who will lead a tour of the carefully tended cemetery grounds on Saturday morning, October 23rd at 10am — details above. Published October 20, 2010, in the Snohomish County Tribune.